For years, drivers all the way from Pooler to Bluffton have been looking for a different kind of vehicle—something that positions itself between a wagon and a crossover SUV. The 2018 Toyota C-HR offers just that profile, giving you plenty of room for passengers and cargo at a price that won’t break the bank. The all-new C-HR is available in two different trim levels, both of which come with a premium lineup of features. 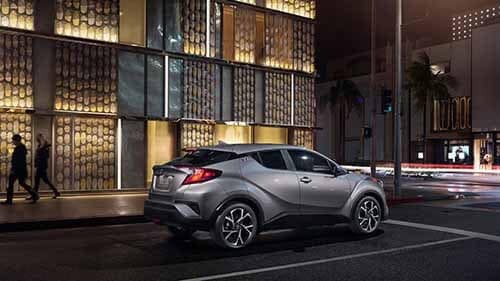 Find out which of these trims is best suited for your driving needs, and then make the trip to Savannah Toyota to check out the 2018 C-HR in person. With an accessible MSRP from just $22,500*, the XLE provides an affordable entry into the small crossover segment. It comes standard with 18-inch alloy wheels, a neatly integrated rear spoiler, and a 7-inch touchscreen with Bluetooth® phone and audio connectivity. Move up to the XLE Premium for an MSRP from $24,350*. This trim tacks on a number of premium features, including integrated fog lights, puddle lights with an eye-catching “Toyota C-HR” projection, and even a Blind Spot Monitor with Rear Cross-Traffic Alert. This suite of driver assist safety features comes standard on the XLE base trim and includes Full-Speed Dynamic Radar Cruise Control, the Pre-Collision System with Pedestrian Detection, Lane Departure Alert with Steering Assist, and Automatic High Beams. If you like the idea of not fumbling with your keys, then go with the XLE Premium to get this set of features, which allows you to get into the car and fire up the engine without ever touching your keys. In addition to the abundance of exciting features listed above, every Toyota C-HR also comes with an efficient 2.0L inline-four engine that gets an EPA-estimated 31 mpg highway and 27 mpg city. Inside the cabin, you’ll have seating for up to five passengers, as well as 19 cubic feet of dedicated cargo space in back which expands to 36.4 cubic feet with the rear seats folded. Plus, there’s even more to love about the C-HR, but you really need to experience it to believe it. Come browse our selection of 2018 Toyota C-HR models today in the Lowcountry at Savannah Toyota, located at 11101 Abercorn Street in Savannah, GA. We’re open Monday through Saturday, and, in addition to the C-HR, here you’ll find the complete new Toyota lineup on display. Still have questions? Don’t hesitate to give us a call for more info or to schedule your test drive!